Take a look at my new pair of shoes! Okay so these a probably not the sort of thing I would wear for a night on the town (tho some may! ), but these shoes are actual very useful. They are known as Back Door shoes, not to be confused with garden shoes. The Back Door Shoes launched 2007. They are based in Dorset and are the sellers of these rather strange but funky looking and very practical shoes. If your reading and still baffled as to what there use is, then ask yourself this – “How many times have you had washing hung out on the line, then eighty warning the heavens open up”? It’s happened to me a fair few times. When this happens (often in this country) there are usually 3 things that come to mind which I do. 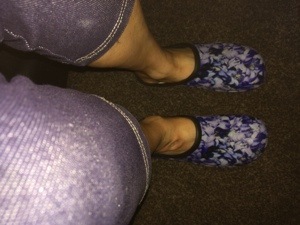 *1 – leave the washing out full of dirty rainwater, *2 – go out barefoot and risk hurting my feet, getting them wet, dirty and may even slip or *3 run around the house like a loon shouting “WHERES MY SHOES! whilst the washing still gets wet. This is the exact sort of scenario which prompted owner Stephen Avery to create the Backdoor shoe. In and out of a house with soggy socks, wet shoes, dirty feet. This creating grubby carpets or slippy floors. Another common panic scenario which comes to mind is the early morning sound of huge lorries pulling up, clanking and banging and then you realise “I haven’t put the bin out” panic ensues as you rush around trying to find a pair of shoes. By the time you find them the binmen pull off leaving an already overflowing bin waiting another 2 weeks. These outdoor situations and more can easily be resolved by keeping a pair of backdoor shoes by the back door (or front). They slip on the feet easily like slippers or mules. 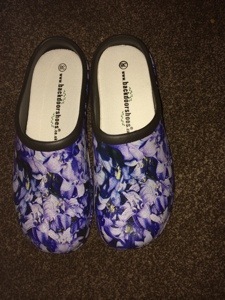 Very lightweight, comfortable on the feet, washable and of course waterproof. 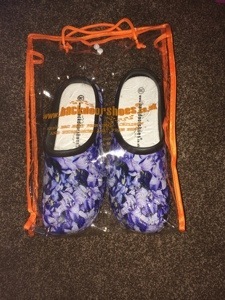 They come in lots of different styles, colours, patterns to suit all sizes of feet. They have lots of room inside them and even come in their own plastic reusable bag with handles. The white textile insoles inside the shoes are fully removable and washable for when they get a bit grubby. Mine will be staying by the backdoor and have already proves very useful for bringing in washing when it starts to rain. They could even be used for just lounging around the garden on a sunny day or popping over to the neighbours to borrow some sugar. The shoes cost £20 which may seem like a lot to pay out but these are the sort of thing that you probably won’t need to buy again, at least not for a fair few years so will certainly get your money’s worth out of them.